As we've mentioned in many a Fitness Friday post, exercise can come in many shapes and sizes. Leu the tiny fur seal pup gets some exercise playing with his trainers. And Isaac the hulking male fur seal does a little strength training with his front flipper stands. 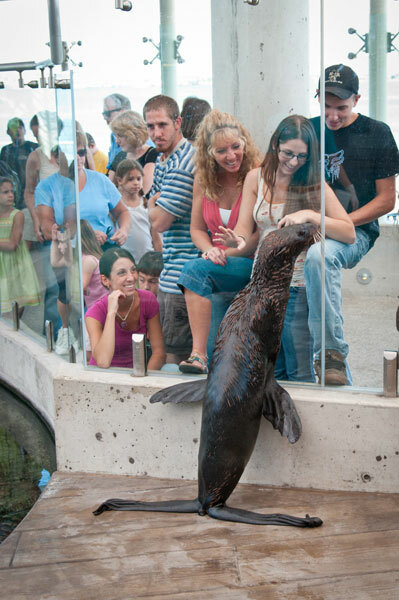 Today we wanted to point out that our harbor seals and fur seals and sea lions can sometimes get their exercise interacting with the public through the glass! Here you see Cordova, one of our female fur seals leaning against the wall. It takes a lot of strength to hold themselves up there like that! When the mood strikes them, those whacky sea lions do the same. These two especially like inspecting the colorful stuffed animals held by some of our younger visitors. Many visitors have also enjoyed playing follow the leader with our harbor seals while they bend and bob in their exhibit on the front plaza. So the next time you visit, you might be lucky to get up close and personal (through the glass) with one of these amazing marine mammals. Take a moment to think about this nifty show of strength and agility in our marine mammals!